In fact, so obsessed are Indians with a fair complexion that in addition to fairness creams, usage of cream bleaches to lighten skin colour also is on the rise. A survey conducted by a leading bleach manufacturer has in fact revealed that around 90 percent of women bleached for a fairer complexion while only 10 percent bleached to camouflage superfluous hair. * One should not bleach too often- once in a months should be alright. * Store bleaching products in a cool, dry place. * Before you apply the bleach, wash the area to be bleached with mild soap and water. Then dry it. * Always conduct a patch test on the elbow before applying bleach in the face. Apply little bleach under your elbow and let it stay for 48 hours. If you experience any irritation, redness, inflammation or any kind of discomfort takes place, do not use the product. * A slight tingling sensation while the cream is working is normal, but it shouldn't be painful. A strong, burning feeling is a good indicator it's too strong for your sk in, or you're allergic to a bleaching ingredient. * Also do not bleach after a hot bath as the skin is more sensitive then. * Leave the skin free to breathe for 6-8 hours after bleaching. It is always best to bleach the skin at night or late in the evening. * Keep bleached area out of direct sunlight for at least 24 hours. * If you are using Retin A, Alpha Hydroxy, or Glycolic Acid on your skin, it’s recommended that you shouldn’t bleach that area of the skin. *Always prepare the bleach mixture as much as you require and do not disproportionately change the ratio of ingredients to be mixed, wrongly assuming that a stronger preparation ensures better results. Always prepare the mixture as soon as you are ready to begin. And discard any leftover mixture; do not reuse it. * However you can do some slight modifications. When bleaching the face, mix a little less of ammonia crystals than recommended. And when your bleaching your arms or legs, mix a little more of the crystals. * Gently cover your skin area with bleach, do not rub it vigorously into the skin. * Do not leave the bleach mixture for a longer time than specified on the package. You can wipe away a bit using the spatula to see if the hair is of desired colour. If not, reapply on that part and check again in a few minutes but in any condition do not leave the bleach for more than 15 minutes. * Don’t use bleach on areas where you shouldn’t - near eyes, eyebrows, inside nose, for instance. Also don’t use it on extremely sunburnt, irritated, burnt, chapped skin or an area that is freshly tweezed or shaved. * Don't bleach if you're trying to get pregnant, are pregnant or think you may be pregnant. Also avoid bleaching when you are nursing your baby. * Once the hair is all lightened, rinse off the bleach using cool water and gently pat dry with a smooth towel. * The skin pores get thoroughly cleansed by the hydrogen peroxide in the bleach. Hydrogen peroxide has been universally acknowledged as a cleansing agent. But hydrogen peroxide can also lead to temporary increase in growth of facial hair, which soon subsides. However if the rate of growth appears to be high, discontinue bleaching for some time. That’s why, if you are undergoing laser treatment for hair-removal, it’s highly recommended that you forgo bleaching. * Incidentally, if you do come across a defective bleaching cream, complain to the FDA authorities. * In spite of all precautions if you do experience a burning sensation or there are rashes on the face after bleaching, gently rub pure coconut oil over that area and wash it off with cold water. Alternatively, one can rub ice over the affected allergic area for 10 to 15 minutes or a little longer and at intervals till the reaction subsides. I've heard about lemon juice. My friend actually does that. I haven't seen a whole lot of difference with these home remedies though.I would just suggest buying a higher SPF sunblock for your body. Without a tan, you will be whiter. Till you notice a difference, just keep putting on concealer that is a light color. I like L'oreal Bare Minerals. It looks natural like it's your own skin color, and it blends well. You can find this at drugstores for very cheap. I think that people should accept their selfs for who they are and the way they look. But i think that dark people are attractive they have a good tan why shouldn't they like that. It kills me to see all of our celebrities doing things like that to make their self look better when they really look fine. But they need to realize that they have fans who might do the same thing to their body. Like that episode with Brittany Spears when she shaved her head well these people did that to cause she did it. People need to grow up and be you. Not try to be someone else. lemon juice is a natural skin bleacher...cucumber and any citrus juice will work...um and stay away from chemicals!and use a good, natural sunblock. Hi Aparna, Good tips ! Nice blog about care of skin beauty and skin disorders. Good and educating posts about nice products and tips. Keep it up. Thanks for sharing your ideas about bleaching. How do I remove unwanted facial hair at home? You could try bleaching your face. A small box of bleach is available at all chemists or general stores, and costs anwhere between Rs 20 to Rs 45 approximately. You could alternately try waxing your sideburns with some cold wax and see if that helps, but your hair growth is likely to thicken slightly. Try applying a besan and haldi paste, and scrubbing it off. For removing hair from eyebrows, upper lip and chin, threading is best. body. It works as natural bleaching. Mix one tea spoon flour of urad pulse, one tea spoon orange juice, 2-3 drops lemon juice. Make paste. Leave the area near eyes & eyebrows. Apply on whole face. Very well written blog, thanks for sharing. 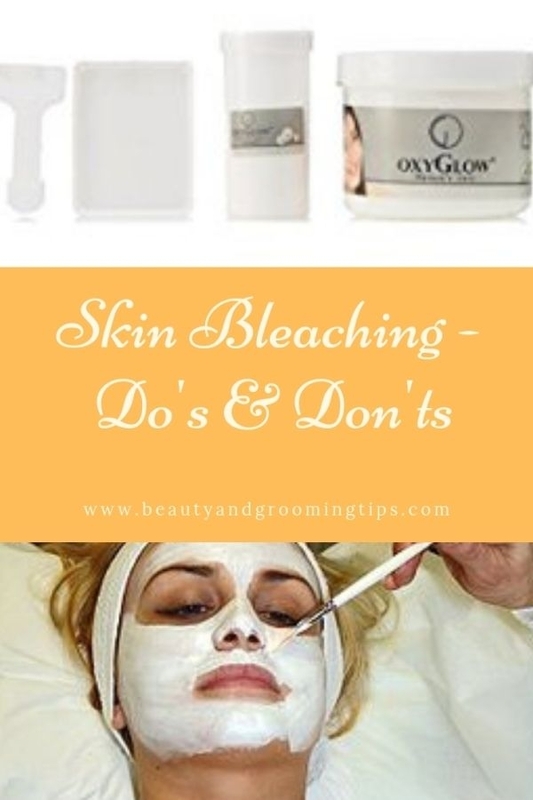 Most of points I always follow during bleaching my skin. Is this true that we should not apply bleach at pigmented area? What is this pigmentation on your skin. ?I?s it due to melasma or 'pregnancy mask'? In any case, please talk to a dermatologist before using a bleach. You should bleach your facial skin first and after 2-3 days do the facial. During facials, your face is also scrubbed to remove dead skin cells and your skin will become sensitive. So if you bleach after a facial, it could be counterproductive to your skin; it might get irritated, develop rashes etc. So better bleach first and then do facial. I need a suggestion...Pls help...My forehead are was slightly burn during cooking atleast 25 days ago..So my que is can I bleech my face. Namita, please do not use bleach on your burnt skin. It's only 25 days and your skin is still recovering and is very sensitive at this point of time.